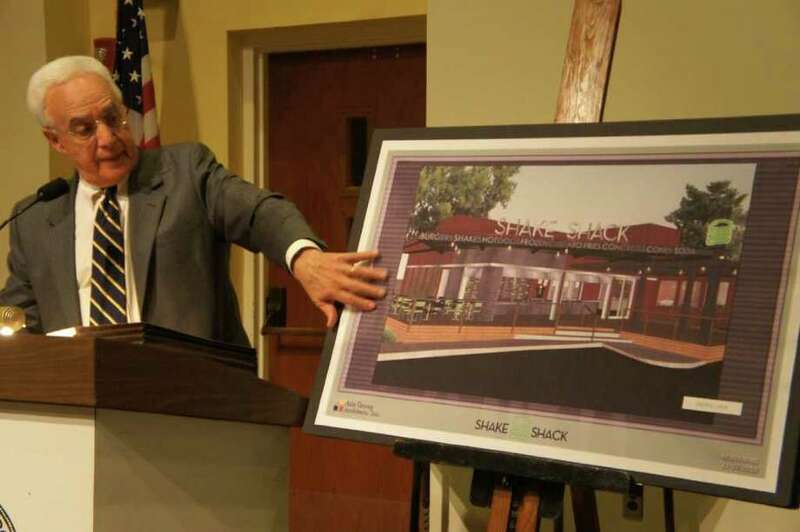 Westport attorney Larry Weisman presents an artist's rendering of the planned Shake Shack restaurant at 1849 Post Road East to the Planning and Zoning Commission on Thursday, March 10, 2011. A month after celebrity chef Mario Batali bought space in Saugatuck for his next Tarry Lodge restaurant, Westport is poised to add another high-profile offering to its dining menu. The burger restaurant chain Shake Shack presented to the Planning and Zoning Commission last Thursday a site plan to build its version of a roadside hamburger stand at 1849 Post Road East next to Sasco Pond. "With the people, the history and the culture here, we thought this would be a great spot to land outside of the city," said Andrew McCaughan, the project manager for Shake Shack. Owned by restaurateur Danny Meyer's Union Square Hospitality Group, Shake Shack debuted in midtown Manhattan in 2004. There are now four other Shake Shack outlets in New York City, as well as restaurants in Miami and Saratoga Springs, N.Y. Each Shake Shack location is owned and operated by Union Square. Pending P&Z approval, McCaughan said that Shake Shack plans to open in Westport by the end of the summer. The Westport Shake Shack site plan calls for a 100-seat restaurant, including 20 outside seats. Instead of building a new restaurant, Shake Shack plans to renovate a vacant storefront that previously housed the Pho Mekong Thai-Vietnamese Noodle House and Restaurant. Shake Shack already leases the storefront, and would continue to do so if the site plan is approved, McCaughan added. Shake Shack would share its building with the Pinnacle Health and Fitness Club, which is located in the rear of 1849 Post Road East. "We're looking forward to the Shake Shack moving in," said Pinnacle Health owner Philip LiCastri. "We think they'll be a really good neighbor." Plans for the Westport Shake Shack follow a series of new town zoning regulations designed to boost local dining establishments. Last May, the P&Z passed Text Amendment 610, which streamlined the approval process for opening outdoor dining on restaurant premises. Dining establishments previously had to go through a hearing process for such accommodations; now the majority of them only need to obtain zoning permits. Two months later, the commission approved another set of restaurant zoning regulations, Text Amendment 613, which eliminated a longstanding rule that mandated a 1,500-foot distance between dining establishments with patron bars. The amendment also eased parking restrictions for restaurants. While the zoning changes did not play a major role in attracting Shake Shack to Westport, McCaughan said they were noted by Union Square management. "We had our eyes on the site, and we wanted it," he said. "And then we saw the zoning regs, and it created an even greater incentive." The P&Z has about two months to make a decision on the Shake Shack site plan. With no commissioners expressing opposition Thursday, the plan is expected to be approved. "Will there be car hops with roller skates?" Commissioner Ellie Lowenstein asked with a smile. In fact, the format of Shake Shack is similar to contemporary fast-food restaurants where customers order and pick up their fare at a counter. McCaughan added, however, that Shake Shack intends the Post Road location to reflect the era of the car hop. "The whole concept of Shake Shack is a modern-day version of a roadside hamburger and hot dog stand," he said. "This is the spot where we could do our first true roadside hamburger and hot dog stand."